Well, since I don't have three hands, I will have to wait until I can get someone to take some photos before I give a progress report on woolcombing my Leicester Longwool. In the meantime, I have finished weaving my undulating shadow weave. As you may recall, my original plan was to use it for jacket front panels, but during the course of weaving I changed my mind and decided to make it a table runner. 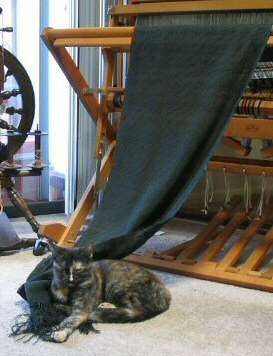 Hemstitching the completed fell before removing it from the loom was no problem. I really like to use these blunt, bent point needles for hemstitching. They make it so easy to work the needle through taut fabric. I purchased them about five years ago at the Naked Sheep Yarn Shop in Black Mountain, NC. The other end was a little more challenging to hemstitch since it was after the fact. Cheryl had suggested weighting the fabric, and I did give this some serious consideration. From a distance, the color becomes quite softened. The effect is pretty much lost in the lighting and jpg optimization. I pulled the fabric over the breast beam and tried to weight it on the floor to give it a little tautness. 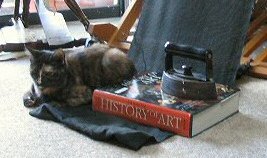 First I tried using a heavy book as a weight, then a heavy book plus a cast iron iron, and finally a heavy book plus cast iron iron plus cat. None of these proved to be very helpful. I really couldn't get it taut enough with this system. In the end, I managed the hemstitching rather awkwardly with no weight and then cut the fabric off the loom. All that remains now is to weave in the ends (which are sticking out of the selvedges since I first intended it to be yardage), and then wash and press. The picture shows the pattern beautifully. And thanks for the tutorial earlier on how you figured out the draft for it. It is strange that the draft would be written out instead of the picture drafts that we have come to know and love. Well done on the hem! Yep, it's a challenge once the tautness is gone...Thinking I'll just hem everything from now on 'just in case'! Ha! 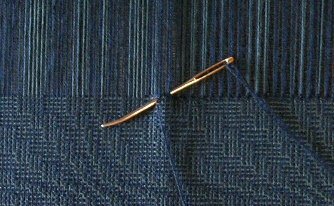 Hemstitching "just in case" might not be a bad idea. It's pretty quick, gives a nice finish, and keeps in from unravaling. Funny how the idea for a fabric can change as it reveals itself on the loom.